In this sequel to The Gospel According to Larry, Larry has been laying low for the past two years since he "died" to escape public notice. He's got a new girlfriend and he's even started to collect a few more possession. But his old life comes back to haunt him, when his old friend Beth tracks him down to convince him to run for public office. At first, the stakes are simply a modest state legislature vacancy, but as Larry find his footing again, his sights aim much higher: President of the United States. There's some fine points to work out (like the Constitutional prohibition against 18 year olds holding the office) and some unresolved issues from the past (Beth, Betagold, etc. ), but Larry quickly acts on his calling to challenge youth apathy and corporate greed. The pace is brisk, the story is humorous and light. Even with the agenda, the book stays light on the sermons. It's an enjoyable read. But I have a hard time giving this a ringing endorsement. It may be missing the point, but the details bother me. 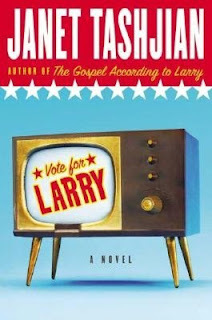 From the logical inconsistencies (Larry somehow only ages a year in two years) to the factual ones (newscasts in Larry's world apparently hold off on calling the results of an election until 99% of the vote has been counted), the book suffers from its lack of credibility. While it is wonderful to imagine that Larry could wrought significant transformations in society and reverse youth apathy, it simply isn't plausible. That message (you have to participate to make things change) is wonderful enough, but how can you buy it when Tashjian gets so many elementary things wrong? Somehow, shooting a little lower would have been more inspiring to me (maybe he should have just gone out for a local election? ).